The term world hunger describes the situation that hundreds of millions of people suffer from hunger in this world although there is enough food for anybody. The number of starving people has considerably increased in the last years: in 1990 there were 822 million people and in 2009 more than a billion people. That is approximately every sixth person on earth. 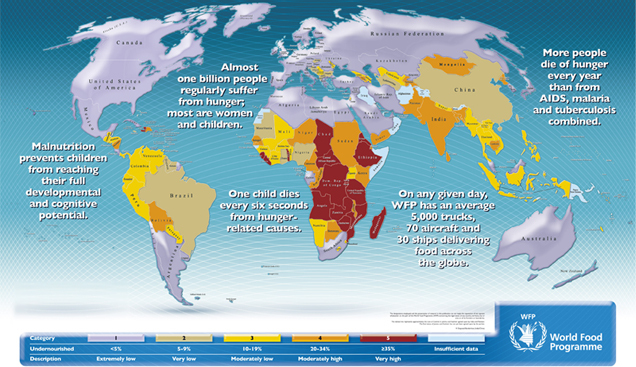 Every year about 8.8 million people die from hunger, about 25,000 per day and thus about 17 people per minute and mainly children. It is to distinguish between immediate famines and the chronicle hunger which permanently concerns sections of the population which are affected by poverty. The latter ones make up the predominant part of todays hunger. According to the world hunger report, agriculture could feed 12 billion people normally (2700 calories per person and per day)  almost double of the amount of number of people on earth (today we are about 6.4 billion people). That is why there is no reason that only one person should die of hunger. This fact is even more astonishing as the right to food belongs to the Human Rights (Article 11, international agreement on economic, social and cultural rights).